The Swarna Jayanti Celebrations of HH Sri Sri Muralidhara Swamiji was celebrated in the United States as a six-day Madhura Utsav from March 15-18, 24-25th 2012, in accordance with Bhagvata Dharma – consisting of bhajans, kirtans of Sri Swamiji, discourses on Bhagavata Dharma and traditional art forms like Puppet Shows and Bharatanatyam. 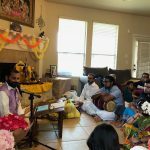 The six-day Jayanti Celebrations culminated in a grand Mass Prayer with Mahamantra Kirtan led by Shri Poornimaji – where hundreds of devotees gathered from various parts of Texas and other states and chanted the Mahamantra with enthusiasm and exuberance. The Madhura Utsav was off to a good start at the Karya Siddhi Hanuman Temple in Frisco, TX. Nearly 250 people attended this memorable first day of spiritual discourses in English led by Shri Poornimaji. The evening program commenced with a cultural feast for both our eyes and ears, with the Madhuragitam rendition by the children, youngest of them being only 3 years old. The rendition of Sri Swamiji’s Kirtans ended with ‘Anjaneya Rama..’ Song. The children were accompanied by Amaey at the Mridangam and Sri Ramanji on keyboard. 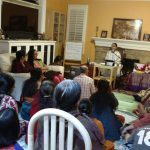 The main event, Spiritual discourse series of “Ancient Wisdom for Modern Times” by Shri Poornimaji began with the first topic “Blissful path to a blissful goal”. Shri Poornimaji dwelt on the true meaning of Satsang and its greatness. She elucidated beautifully the fact that Bhagawan blesses one with association of a living Mahatma, and following the Bhagavata Dharma has more merits than Moksha. She spoke about how a satsang establishes a connection between Bhagawan and the soul, quoting from Ramayana and other scriptures. After the harathi at the Hanuman temple, the evening ended with a delectable Mahaprasad. The second day of the Madura Utsav 2012 celebrations continued at the Hanuman Temple nearly 300 people in attendance. The evening began with a cultural program, Madhuragitam by Shri Prabhu and Shri Kalyan, who provided an excellent rendition of some of Sri Swamiji’s kirtans. They were accompanied in chorus by Shri Balaguru and Shri Ramji, on stage, and the audience listeners. The musical accompaniments included, Shri Saravanan at the Mridangam and Shri Koti at the Dholak and Shri Raman provided the keys. Shri Poornimaji weaved a heavenly cloth interlaced with these golden thoughts as strands and presented to the audience effortlessly. Thus she demonstrated “The Play of Divine Grace”, reminding the simplicity and comfort with which one can follow the Bhagavata Dharma. The evening came to a close by honoring the Mahaprasad sponsors for the day (Smt Asha Anand & Sri Kannan Anand and Smt. Jaya Anand and Sri Anand Krishnamurthi). Harathi and Mahaprasad that followed brought the second day to a close. The third day of the Madura Utsav 2012 saw nearly 500 people who attended the Swarna Jayanti Celebrations at Frisco, TX. The cultural program for that evening was “Krishna Provides”, an enchanting puppet show presented by The Dancing Peacock Puppet Company with its endearing peacock-mascot ‘Kutti-Kitta’ that stole the hearts of young and old alike. It was so popular and well-received that an encore performance was requested by many parents and children! 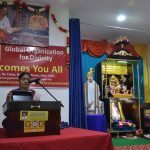 Shri Poornimaji’s lecture topic was “The Hallmarks of Devotion”. She spoke about how ‘preyas’ has to be overcome to achieve ‘shreyas’. Quoting from Prahlada Charitra and Ramacharita Manas, she brought out the glory of Guru and Nama. She quoted from Bhagavatam and other Bhakta Charitra to show how Satsang was both a means and the end. Shri Poornimaji’s discourse was followed by Harathi and Mahaprasad (sponsored by Smt Ramya Ganesh-Sri Ganesh and Smt. Priya Mahesh and Sri Mahesh). The evening continued with the vibrant Divyanamasankeertan headed by Shri Balakrishnan Mama who described the ritual in its simplicity, inviting one and all to participate in singing and dancing around Lord Sri Krishna. A spectacular musical performance for this event was provided by the talented Shri Prabhu, accompanied by Shri Kalyan at the vocals, Shri Saravanan and Sri Koti at the Mridangam and Dolki respectively, Sri Raghu on Tabla and Sri Raman on the keyboard. Children, adults and elders alike sang the Lord’s glory and danced in joy with dandiya sticks, transforming the premises into Brindavan. The delightful celebrations continued into the wee hours of the night, and finally ended with “Kaliyaiyum bali kollum’ followed by Mahamantra chanting, bringing a blissful third day of Madura Utsav to a close. Around 400 people were fortunate to attend the fourth day of the Utsav this pleasant Sunday afternoon. The program began with a melodious rendition of several of Sri Swamiji’s kirtans by the students of Pranavam School of Music led by Smt. Santhi Mahadevan. They were accompanied by Shri Saravanan at the Mridhangam, Shri Koti at the Dholak and Shri Ramanat the keyboard. All the performers of the cultural program were greatly appreciated and duly honored by Shri Poornimaji. Immediately following the cultural program, Shri Poornimaji, began the final presentation of the Spiritual discourse series at the Hanuman Temple, aptly titled “The Secret of Surrender”. Touching on the concepts of ‘Ahankara’ and ‘Mamakara’ she described how the grace of the Guru and the Divine Name can annihilate these roadblocks to the Supreme. Speaking on the nine types of Bhakti with examples, Poornimaji nicely narrated how chanting of Bhagawan Nama would kindle the spiritual aspiration within oneself and make a complete inner transformation in due course. With hearts filled with Bhagawan’s compassion, and some eyes filled with tears, the discourse ended with Mahamantra chanting and prayers. After the Harathi, the Mahaprasad sponsors for the day (Smt. 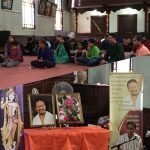 Sudha Karthik – Sri Karthik and Smt Viji Sankar – Sri Sankar) were honored. Shri Mayakoothan then delivered the vote of thanks, and invited more people to attend the ‘Mass Prayer’ session the following week. The evening ended with the serving of delicious Mahaprasad. The second part of the Madura Utsav 2012 and Swarna Jayanti celebrations of our beloved Guru Maharaj took place at the Youth Center in DFW Hindu Temple in Irving, TX with nearly 250 people in attendance. The devotees were welcomed by Smt. Anita Singhal, President and Smt. Omana Nair, the Event Chairperson from the DFW Hindu Temple. The evening began with the cultural program, Madura Geetham, by GOD Satsang members who rendered Sri Swamiji’s Kirtans. They were accompanied by Shri Koti at the Dholak, Shri Raman at the Keyboard and Smt. Seeta at the violin. 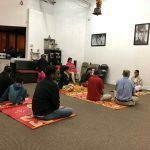 Shortly after, the next chapter in the Spiritual Discourse series of “We are here to pray, leave your fear” began at the DFW Hindu Temple, with Shri Poornimaji elegantly describing “The Power of Prayers”. She expounded Bhagavan’s grace by narrating the story of Dhruva. She explained the cause and effect cycle and quoted Bheeshmacharya’s last moments to show how with divine grace, even afflictions can turn into blessing. She underlined the power of divine grace invoked through prayers in overriding the cause-effect cycle. Narrating the episode of Gajendra, she underlined the power of prayers, thereby presenting a prelude to the following day’s Mahamantra Mass prayer session. At the end of the discourse, devotees who relished on food for their souls also got to enjoy delicious Mahaprasad that was sponsored by ‘Our Place’ Indian restaurant. The grand finale of the Madura Utsav 2012 and the Swarna Jayanti celebrations of our beloved Guru Maharaj included several cultural programs and culminated in a mass prayer that was enthusiastically attended by more than 700 people on a lovely Sunday afternoon, at the DFW Hindu Temple. Devotees from 7 other states of the country participated in this grand event. The guests were welcomed by Smt. Omana Nair, Vice President of the DFW Hindu Temple Society. The attendees were treated to a melodic saxophone recital by Shri Shyam Murali who aptly performed the kirtan, ‘Bhagyam Ullore Vaarungal’, in addition to others. He was accompanied by Shri Murali Bala at the Thavil. This was followed by a wonderful feast for the eyes and ears in the form of an Indian classical dance recital ‘Bhaktanubhavam’ by ‘Natyamitra’ – a group of talented young women who choreographed Sri Swamiji’s kirtans with utmost interest and beautifully rendered them as a Bharatanatyam dance. A presentation on Sri Swamiji and His mission, in addition to Nama Anubhava from a few devotees led to the much awaited Shri Poornimaji’s discourse – “We are here to pray, leave your fear”. Explaining the Lord’s descent in human form as the Guru, she emphasized the path that the Guru would show – one of Nama Sankirtan. She narrated an anecdote from Adi Sankara Bhagavatpada’s life story to illustrate how the Lord’s Divine Name has the power to evade one’s Karma. Referencing several real-life instances from recent past, she drove home the significance of Nama Sankirtan. 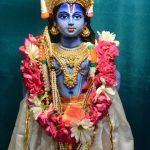 The devotees were reminded that the greatness of the Mahamantra is that it works whether it is chanted whole-heartedly or not, and it ushers in goodness and inner peace in one’s life anytime it is chanted. With that preface, the Satsang proceeded to the Mahamantra Mass Prayer were devotees were enthralled in singing and dancing to the Divine Name, followed by their prayer requests that were placed at the Lotus Feet of the Lord. One and all present there could feel the vibrations of the Divine presence. The program concluded with felicitations to the temple authorities and the Mahaprasad sponsors, Smt. Vidya Ramji and Sri Ramji. ‘Kaliyayum Bali Kollum’ Kirtan was rendered during the Harthi which was followed by Mahaprasad. Smt. Arthi Ravi facilitated the on-stage events on all the six days of the program. A souvenir prepared specially for the program, Mahamantra CD and stickers were given as prasadam to all the attendees of the program. By the immeasurable grace of our beloved Master, the devotees delighted in this unforgettable series of spiritual retreat. They were inspired and mesmerized by Shri Poornimaji’s satsangs augmenting their faith in Namasankirtan, and prompting many new people chant the Mahamantra. It was a blissful and memorable Madura Utsav 2012 and Swarna Jayanti celebrations of our beloved Sadguru in Dallas-Fortworth that will be engraved forever in the minds of those who were blessed and fortunate to attend.